New and improved customized wefting! This hairs finer texture makes for beautiful curly hair. This hair is perfect for a virgin curly hair beginner. 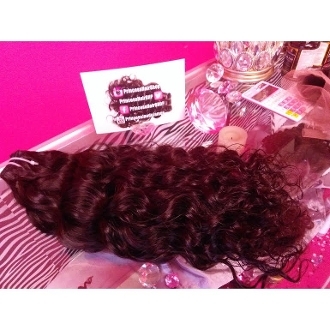 Its texture is soft, yet slightly coarse, and easy to moisturize and maintain its bouncy loose curls. The curl patterns have been created to mimic beautiful 3A curls. You can flat iron this hair to wear it sleek and straight and back to curly. As always; be sure to use a quality heat protectant each time to preserve the integrity of your investment. Colors are natural 1b-3 Wefting has been customized. This hair is reported to have minimal shedding.